Out of the corner of her eye, an Alaskan woman driving down Rabbit Creek Road in south Anchorage saw a shadow and thought it was a bird until taking a second look. “It was a little bit bigger than a bird,” Danika Donnelly told KTUU. In fact, it was a grizzly bear racing alongside her and easily keeping up at 30 mph. Donnelly, 21, was on her way to work at a drive-thru coffee shop in Anchorage at around 8 o’clock Wednesday morning when the unusual encounter occurred, according to Jared Gilmour of McClathy Newspapers. To those who have suggested she was harassing the bear by driving next to it, Donnelly told Gilmour she wasn’t honking her horn or doing anything to stress the bear, instead the bear seemed content and was already running beside her when she noticed it. Photo is a screen grab from the video. A cyclist was riding with some buddies near Prospect Reservoir in Western Sydney, Australia, when confronted by a kangaroo that thought it could jump through him. From BNQT: Can you spot the hidden animals? He avoided a possible collision that time. The rider was not injured, nor were the kangaroos. Three salmon fishermen avoided death or serious injury by jumping into the frigid waters of the Columbia River after failing to get the attention of the driver of a speeding boat that was headed their way at high speed. 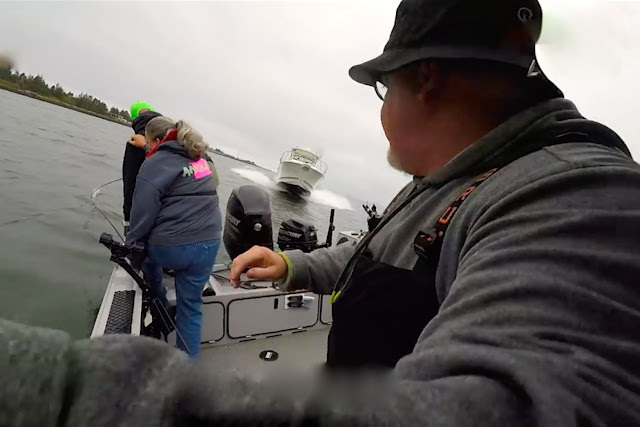 The frantic moments were caught on a GoPro camera mounted at the front the boat, as reported by The Oregonian. The incident occurred over the summer, but the video was just posted online Tuesday, coinciding with the news that Maess had filed a $372,500 lawsuit against the driver of the offending boat--Marlin Lee Larsen. McMahon and Durham plan to also file suit. Clatsop County sheriff’s deputies accused boat driver Marlin Lee Larsen of several crimes after the 75-year-old told investigators he couldn’t see where he was driving because he was sitting down and the dash of his boat was blocking his view. Larsen said he probably should have been standing, according to the sheriff’s report, which notes Larsen uses a motorized scooter to get around on land. Larsen’s son-in-law, who also was on the boat, told investigators that he had warned his father-in-law to pay attention, that he sometimes sees his father-in-law using his cell phone while driving the boat and that his father-in-law had been off-and-on his cell phone the morning of the crash, according to the sheriff’s report. The lawsuit, filed earlier this month, claims Larsen was boating while distracted by his cell phone on the morning of the Aug. 12, 2017, when the crash occurred near the mouth of the Columbia at the Pacific Ocean, just east of Fort Stevens State Park. Sheriff’s investigators wrote that it was likely Maess and the others would have been seriously injured or killed if they hadn’t jumped into the water. As it was, the suit says Maess suffered vision problems, headaches and injuries to his ankle, leg and arm from jumping into the water or being struck by debris, and he still wears a knee brace to this day. The others suffered unspecified injuries including cuts and hypothermia. Durham also suffered psychological trauma. The Oregonian said that Larsen pleaded not guilty to the misdemeanor crimes or reckless operation of a boat, fourth-degree assault and recklessly endangering the lives of others. Actor Rob Lowe felt relatively safe and showed no fear while paddleboarding around two great white sharks off Santa Barbara, California, but a shark expert indicated to “Good Morning America” that he might have had a false sense of security. 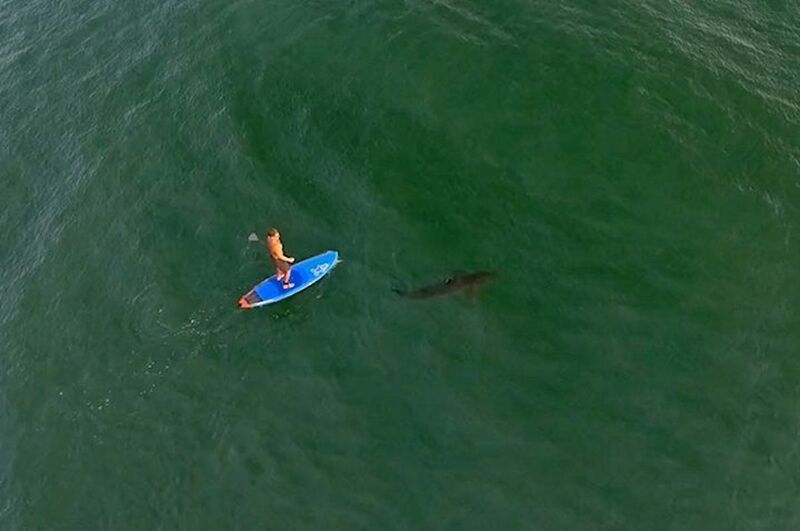 Lowe, who has spent a great deal of time on the water in his lifetime of fishing and surfing, had never seen a great white shark until the encounter last weekend in which he described as a “once in a lifetime” moment. The two great white sharks were as big or bigger than Lowe’s paddleboard, but the actor had a sense of calm around the apex predators. Still, Kajiura said those who encounter a great white shark should feel lucky (seeing them in nature is like “winning the lottery,” he said) but should get out of the water. "Just because he's inches above these small sharks doesn't mean that there's not a big one down there as well," Kajiura told GMA. 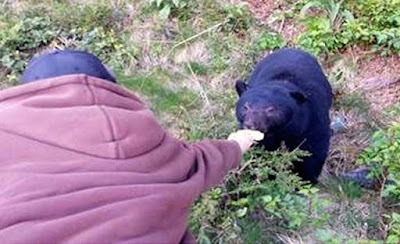 Back in April, two men fed a black bear rice cakes alongside Highway 4 near Torfino on Vancouver Island and videotaped part of their hijinks, which they put onto social media. 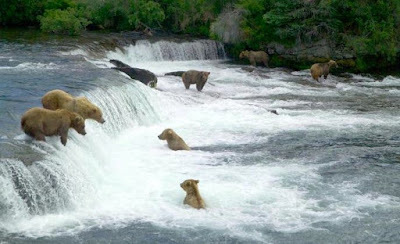 The public outcry was immediate with many Canadians saying a fed bear is a dead bear. “It is illegal to feed dangerous wildlife because it’s extremely dangerous for both the public and that bear,” Port Alberni conservation officer Daniel Eichstadter told CTV News Vancouver in May. “It may expect food from somebody else who stops and injure somebody that way. Thanks for several tips, the Canadian authorizes managed to track down the two men and this week they faced the consequences of their actions. The unidentified men were charged with intentionally feeding dangerous wildlife under the BC Wildlife Act and each were fined $345, according to CTV News.